4x7 Customized Magnets - Outdoor & Car Magnets 55 Mil Round Corners are good choice to spread awareness about your brand among target customers. 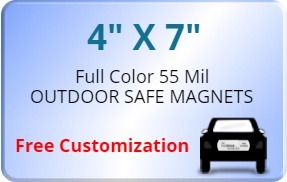 Car wash services, car rentals, real estate businesses as well as auto repair shops can make the most of these outdoor safe custom rectangle and square magnets. They are Made In USA and are provided with round corners to ensure best durability. Order these custom magnets now to get free design, no set up fee and lowest price guarantee offers. Request a quote to know what you can save on ordering 4x7 Customized Magnets - Outdoor & Car Magnets 55 Mil Round Corners.